Shaun Deeb picked up a career-best score and his third WSOP bracelet to tie Volpe for most all-time from former #1s. 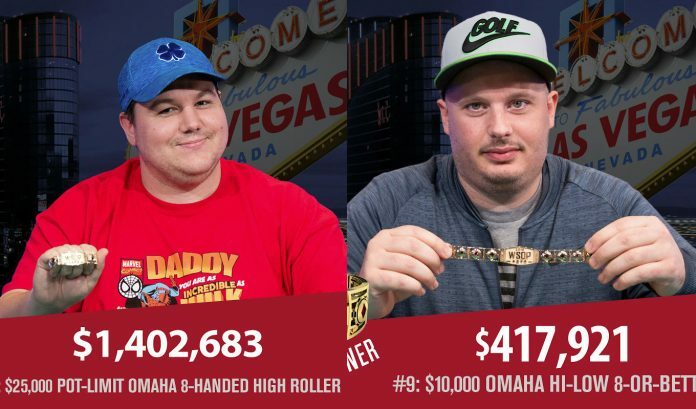 Just past the three-quarters mark of the WSOP and Paul Volpe is no longer the only former #1 to pick up a new piece of jewelry. Shaun Deeb beat out 229 players including a final table featureing Jason Koon, defending champ James Calderaro, Scotty Nguyen and Ben Yu to win the $25,000 Pot Limit Omaha High Roller event for $1,402,683. Deeb now has three WSOP bracelets and is tied with Volpe for most by a former #1. It’s the largest live tournament score of his career by a factor of over four. His previous biggest cash came in the 2015 WSOP $10,000 Pot Limit Hold’em Championship event. With 11 cashes at the 2018 WSOP, Deeb is now just one cash behind Chris Ferguson for the overall lead. Just one year after playing a very limited WSOP schedule, Calvin Anderson is back playing his normal pace and has so far managed to pick up eight cashes. His best result came in the $10,000 Triple Draw Deuce-tot-Seven event where he finished 12th for $19,428. Anderson also returned to his online roots to earn a baby cash in the $565 WSOP Online Pot Limit Omaha event. Eight is the most cashes Anderson has recorded in a single WSOP, breaking his previous best of six (2016 & 2013). Chris Moorman sits just behind Anderson with seven cashes this summer. He picked up two cashes in the last week, the first coming in the $1,000 Big Blind Antes (30 minute levels) event where he finished 181st for $1,621. He followed that up with a 106th place finish in the $1,000 Tag Team event where he teamed with Jeremy Menard. Since winning the $10,000 Omaha Hi-Lo event on June 5, Volpe has picked up just two WSOP cashes. He finished 14th in the $10,000 No Limit Deuce to Seven event and followed that up with a 32nd place finish in the $25,000 PLO event that Deeb won. Those two cashes earned him almost $56,000. The four cashes that Bryan Piccioli has picked up so far this summer aren’t exactly anything to write home about. He finished 1,406th in the Colossus ($920), 730th in the Millionaire Maker ($2,808) and 231st in the $1,500 No Limit Hold’em Bounty event. His best result came in the $1,000 Double Stack where he finished 58th for $9,758.